I agree with this 100%. Scale the calibration curve UP to make the car rich (make it think it is getting more air than it is.) Then collect data, step-by-step, at increasingly higher flows, calibrating as you go. You will never get the open loop AFR to match the targets in the table. Not perfect, no. But if you gather much data under various conditions then plot Adjusted Flow vs. Voltage, you will see the a scatter of data, through the middle of which your calibration curve should go. The relative error looks to be about 10%. It seems like some people are nuking this thing.... perfect is the enemy of good - a few % points off is no big deal. If you can get +/- 3-4% you are golden. the VE table. I was guessing that it should be fairly important as load is calculated based on how much air the engine can flow. it should have almost as much effect on load as the MAF reading? 1) My MAF is decently calibrated. Not complete, but decent. 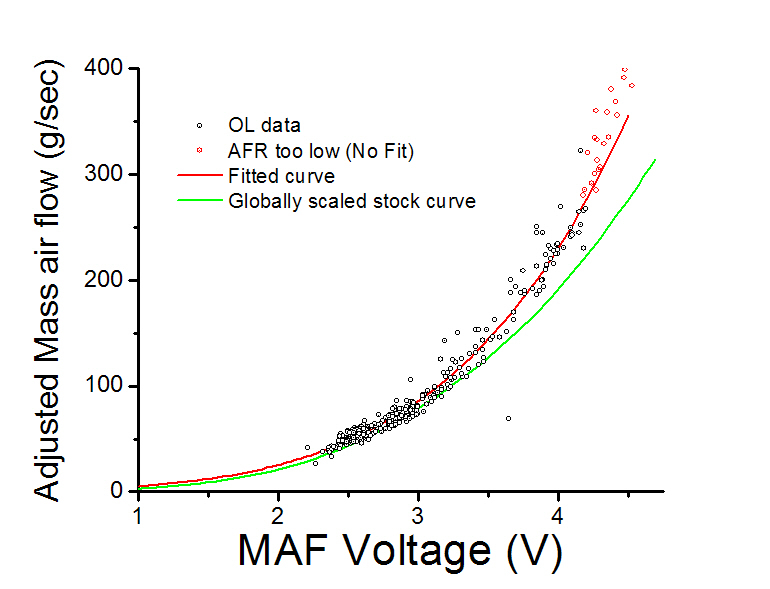 2) Contrary to stated opinion on another thread, you CAN fit a curve to the Airflow vs MAF volts data. You just have to have the right model/equation. I will give you one hint: Belehradek. 3)You can get your measured AFR close to your expected AFR in OL. There is error, but it is close. With limited data, but in a well calibrated region of flow, at steady state, the average percent error is less than 10% and not statistically different at a p=0.05. Certainly this may change under dynamic conditions, but it is supposed to. Make a new thread, and leave this thread for calibration discussions. Srsly. I would love to read folks opinion/results on this table, but it deserves its own thread in the engine management section. would like to see what you have to say about this once you are tuned and have done runs at various throttle positions/loads . yeah it possibly deserves it's own thread however the calibration procedures described here aren't strictly MAF calibration they are system calibration procedures. it is load you are fudging via the MAF. if the VE table is involved in the load calculation then it is probably part of the reason MAF calibration isn't always perfect. hymee's explanation of VE and load_abs are a good reference. I know when the VE tables are expanded for FI they are flat and possibly need tuning for accurate loads? Under dynamic conditions (RPM changing with time, throttle changing with time, ) all bets are off. Read exactly what I wrote. It is an hypothesis, currently, and I will try to disprove it as best I can, but I would bet a six-pack of good beer that in OL at steady state (no change in speed, throttle) measured AFR will match expected. Yes, the VE tables need to be adjusted for boost. I don't know the best way, so I'll just say play with them like me. What exactly did you do with the VE tables? This is also correct, IMHO. I have found that playing with the VE for the boosted ranges are more productive than scaling the MAF. However, since the our stock scaling only goes to 365 g/s, anyone running over 9lbs. of boost has to scale theirs to account for the extra air. I changed the numbers at the bottom of the y-axis(using ATR) to reflect my new maximum loads under boost. Then I did a few-hundred data logs, slightly changing the VE in boost across the entire rpm range untill I started seeing my target AFRs. I actually came pretty damn close, and I never touched the MAF scaling. This is not to say it will not work, just that I did this because when I tried only scaling the MAF, the only way I could get my target AFRs was to create unrealistic numbers(400+ g/s w/only 8lbs of boost) on the upper end of the scale. I still plan on going back to the MAF now that I am comfortable with the VE table. Please dont take this the wrong way, but when you just state a fact with no presented evidence to back it up that is completely contrary to the presented data posted, I cant do anything with your post than ignore it. No worries. I am not trying to convince anyone that I am right. Just throwing my "limited" experience out there. I have created well over 50 maps for my FI RX8 at this point using the ATR software. My posts are only meant to assist those using said software, since I do not have any experience using other tuning devices/means. I guess I should have been a little more precise, knowing members of this forum, but I'll try to correct that now. When I stated that using VE seemed to be more productive, what I meant was tuning with VE was the ONLY way I could get consistent AFRs when boosting across then entire rpm range. I don't have any maps, charts, data logs, etc to show this. So sorry. None of this was meant to say scaling the MAF isn't necessary. I freely admit that I tried several times and never got the results I wanted. I am reading this thread to hopefully learn something about it. Good luck with your MAF scaling spreadsheet. If you want someone to try it to prove it actually works, I'll be more than willing to. I love you guys.... but good grief your making this a lot harder that it needs to be. You guys are jumping the gun - stop messing with stuff. Go one step at a time.... if you are getting turbulence then that is an intake issue - but barring that, you can scale the MAF - it is just tedious. Keep in mind it is slow... so you have to get it at one consistant voltage for 20 seconds or more to get the AFR's to stabilize. This is hard to do at higher loads without a dyno. iterative process. The output of the parameters are then be used to draw a new calibration. Spoken like a true scientist. Great analysis carbonrx8!!! Holy crap. That was a tough read. Care to break that down barney style? The part I am most interested in is the device/software that can calibrate your MAF for you. there is no denying that you can (can't what was I thinking) scale the MAF based on AFR however it is interesting where the relationship between AFR and MAF flow breaks down. I will hazard a guess that the calibration at high flows falls over due to a map that has been extended for high loads hasn't been tuned. possibly the VE map? these maps aren't tuned passed 125%-130% load in most cases. there is no denying that you can't [?] scale the MAF based on AFR however it is interesting where the relationship between AFR and MAF flow breaks down. I will hazard a guess that the calibration at high flows falls over due to a map that has been extended for high loads hasn't been tuned. possibly the VE map? these maps aren't tuned passed 125%-130% load in most cases. Not sure what you mean because of the double negative in your first sentence. In my case, I didnt use the higher flows because I had the AFRs set to very low AFR and recorded very low AFR; lower than what he stock wbo2 can record. Were I to have used them, I would be setting myself up for failure. I dont have my innovate logging to the ATR, which would have solved the issue. I agree with you if you are saying that the calibration fails at high flow because there is no calibration. It is difficult to calibrate it at high load (+140%) as it is hard to get there in steady-state (at semi-legal speeds). However, if you do attempt to approximate steady-state at very high loads, I think that the calibration method will provide good results. This would either take a variable-load dyno or VERY high speeds, somewhere in the neighborhood of 120mph. What I think you stated is my guess as well. That there are tables that increasingly interact with the OL tables at higher loads. Somehow, these tables do not interact at low acceleration, low tip-in, or low load. The problem is that in the ATR there is no explanation as to how these tables interact with each other. It is reasonable to wonder if these are availible in the pro version as we know that there are some programing restrictions in ATR. I am not complaining as the ATR is free. I just wonder what we are missing. These interactions can be figured out tho. It will just take many tanks of gas at jail-time speeds. Exactly. WOT runs prolly should not be used to scale the MAF. (Tuning is a different question) Very slow, steady increases in rpm are ok, something less than 10rpm/sec. Anything faster and the wbo2 cant keep up sufficiently for accurate data. Plus the Throttle fuel gear table and, I believe, the Fuel VE table begin to add fuel over the OL maps. All this will **** with your relationship between your measured and expected AFR and screw up the cal. Glad to help if I can. Just break it down. Start with one part and go from there. I am sure that if you didn't get some aspect it was my failure to explain it clearly. I am also sure that if you are wondering about something, others are as well. As for the software, I am assuming that you want to do this yourself? Do you have MS excel? That is what I and everyone else based most of this on. I use OriginPro for all my other higher-end analysis but it is kinda expencive just for playing around. You can download addons for Excel to do most stuff and Excel can be macroed to run Levenburg-Marquart nl fitting. The only problem is that you cant really trust Excel to spit out "true" numbers. It has to ALWAYS be checked as there are old, inherent errors in the excel algorithms that MS has famously ignored for more than 13 years. I should note that you dont HAVE to do this. It was just fun to do. You can make your calibration by hand as easy or easier than curve fitting. You just need to calculate "adjusted flow." Did you understand that part of the above?